Well what a busy start to 2017 it’s been – and we wouldn’t have it any other way! We are so enjoying arranging your trips for this year… we’ve been planning multi-region ten night wine extravaganzas, last minute weekends away, hen parties in Champagne, group holidays in the South of France, and once-in-a-lifetime trips to your favourite regions! Talking of once-in-a-lifetime experiences, we’ve got our 2017 Harvest Break, hot off the press and available for booking now; this unique package ALWAYS gets booked up before the end of February, so see below for full details, and don’t hesitate to book your spaces today. 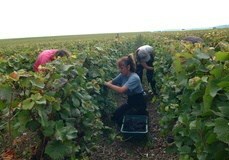 Hands-on Harvest: A three day once-in-a-lifetime experience in Champagne! For many wine-lovers, we know a prime contender on their bucket list is to have the opportunity to experience the harvest period, with hands-on vineyard activities, and we are here to make that dream become a reality! Staying for two nights at the 4* Hotel Jean Moët in Epernay, we offer you the chance to spend the day as a traditional harvester in the prestigious Côtes des Blancs vineyards. This is a great activity to enjoy with your friends and family, with a fun and lively atmosphere! You’ll delight in a traditional Champenoise breakfast as the guests of a family-run Grand Cru estate, followed by a morning of harvesting activities. The harvest is always a time for celebration, and you can rest assured that there will be plenty of opportunities to take a break and raise a glass or two during the course of the activity! 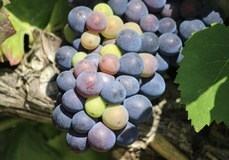 Following the time amongst the vines, you will have the opportunity to press the grapes and taste the fresh juice, and then your hard work will be rewarded with a delicious gastronomic meal, prepared by the in-house Chef, and served with a selection of the Maison’s Champagnes in the opulent dining room of a beautiful French Château owned by the family. The Champagne Harvest package is available mid-week from 9th – 24th September only, and is guaranteed to be fully booked before the end of the month, so if you are keen to try something new this year, ensure you contact us as soon as possible to avoid disappointment! Please note that this experience is already fully booked on Fridays, Saturdays and Sundays. Luxury Wine and Golf: An incredible three day break for just £338 per person! 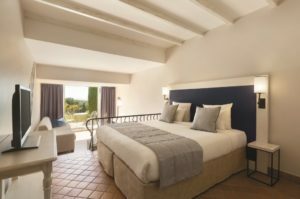 The beautiful 4* Dolce Frégate resort in Provence is the perfect rural retreat in the heart of the Bandol appellation, where you can combine your loves of wine tasting and golfing on this three day break. After checking into a Superior room, you will enjoy a delicious three course welcome dinner in the hotel’s restaurant where you can enjoy dinner overlooking the picturesque golf course. On day two, you’ll delight in a morning of golf on the resort’s eighteen-hole course, widely considered to be on of the most beautiful courses in Europe! 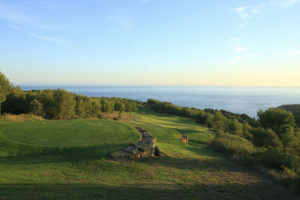 Whilst making your way between the holes, you’ll be wowed by the outstanding views across the surrounding vineyards and out to the Mediterranean sea. In the afternoon, wind down after golf with a tour and tastings at the neighbouring Domaine de Frégate; here, you will be welcomed for a full tour of the estate and cellars, followed by tastings of four of their splendid wines. The price of this package, based on two people sharing a double Superior room is just £338 per person and includes 2 nights’ bed and breakfast accommodation, green fee for 18-hole course, winery tour and 4 tastings, and a 3 course dinner excluding drinks. 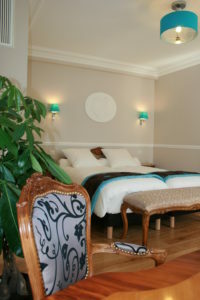 For an extra special treat, you can upgrade to a Deluxe Sea View room for just £14 per person! This special offer is only available when booking on or before 28th February 2017, and is valid for travel mid-week and weekends between today and 31st March 2017.